The meeting to discuss the management and governance challenges at the Overberg and Mhlathuze Water Boards had to be abandoned after Members insisted it could not continue in the absence of the Director General (DG), who was the accounting officer and should have been present to deal with the serious issues before the Committee. The Chairperson said that the DG had called him, asking to be excused as he had prioritised a meeting with Sedibeng Water. The Chairperson had subsequently called the Minister, who had put it plainly to him that the DG was expected to be there for the Committee meeting. He remarked that they clearly had a DG who did not respect the Minister, as well as Parliament. The issues were serious, and he expressed the need for the DG to take those matters equally seriously. Members commented that it was concerning that they attended so many meetings where important issues were discussed, and matters were left in the hands of ordinary officials at a time when they needed the DG to be present. It was seemingly intentional for this DG always to be unavailable for their meetings when there were serious issues that needed his accountability. Members recalled that a joint meeting with the Standing Committee on Public Accounts (Scopa) had taken place, where the Director General had failed dismally to respond to the questions which had been raised, and it had been clear that he did not know what was taking place in his own Department. Although it was proposed that the Deputy Minister and the delegations from the water boards be allowed to table their presentations, most Members agreed that in order to comply with the Public Finance Management Act (PFMA), the meeting should not proceed. The Chairperson therefore directed that the meeting had to be rescheduled due to the DG’s absence. In his closing remarks, he Chairperson said that the Committee was disturbed that since 2015/16, it had not received any budget or annual report from Overberg, and Mhlathuze had no board. This was a serious indictment. How could they operate and exist, as Parliament had not approved any budget? He remarked that their existence was illegal. 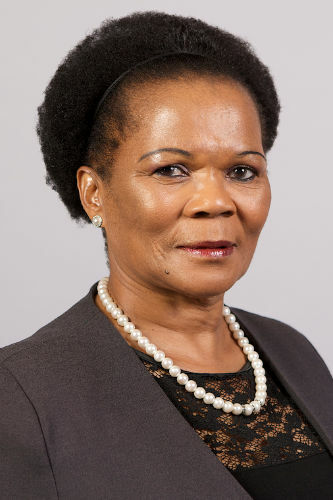 The Chairperson said that apologies had been received from the Minister of Water and Sanitation, Ms Nomvula Mokonyane, and from Mr Dan Mashitisho, the Director General (DG) of the Department, who had sent a notice that Mr Anil Singh, the Deputy Director General (DDG), would lead the delegation. He said he had learnt officially in writing that the Mhlathuze Water Board had been disbanded, and the process for the appointment of a new board was under way. This process had been officially advertised. Regarding to Overberg Water Board, he stressed that they had a very serious challenge there. He was expecting the Director General, with his administrative leadership, to take the Committee through the process. The Chairperson welcomed Ms Pam Tshwete, Deputy Minister: DWS, to give her presentation to the Committee. Mr M Galo (AIC) requested the Committee to first comment on the apologies received before proceeding to the items on the agenda. Ms T Baker (DA) asked about the whereabouts of the DG, and commented that it was concerning that they had so many of those meetings where important issues were discussed and matters were left in the hands of ordinary officials at a time when they needed the DG to be present. She was also concerned by the number of apologies that they received from the DG, leaving other people to answer on his behalf. Mr T Makondo (ANC) commented that he agreed with Ms Baker. It seemed it was intentional for the DG always to be unavailable for their meetings when there were serious issues that needed his accountability. Before the meeting began, that point had to be clarified. Mr L Basson (DA) asked for confirmation that the DG was on leave, and if that perhaps was the reason he was unable to attend the meeting. The Chairperson responded by reading the actual text of the communication from the DG in which he apologised for being “unable to attend the briefing to the Committee of Water and Sanitation on governance and management issues within the water boards, and management and governance issues at Mhlathuze Water Board. Please accept my sincere apologies for not attending the scheduled session due to an urgent meeting with the Sedibeng Water Board, its clients and municipal managers to discuss money owed to them on 7 June 2017”. Mr D Mnguni (ANC) said that the DG did not take the Committee seriously. He prioritised people who were not important and left out the Department to which he was accountable, and that was tantamount to ill-discipline. He requested that the DG explain his actions next time he appeared before the Committee. The Chairperson said that the DG had called him, asking to be excused as he had prioritised the meeting with Sedibeng Water. The Chairperson had subsequently called the Minister, who had put it plainly to him that the DG was expected to be there for the Committee meeting. He remarked that they clearly had a DG who did not respect the Minister, as well as Parliament. The issues were serious, and he had expressed the need for the DG to take those matters equally seriously. He said that they had a delinquent DG. Mr H Chauke (ANC) commented that he understood the situation was abnormal. The matters that they were dealing with were so serious that they required the accounting officer to be present, because at the end of the day the responsibility lay with him. For the DG to go and deal with other issues clearly indicated that he did not take Parliament seriously, and when one did not take Parliament seriously it did not just end there. He disagreed with Mr Mnguni’s suggestion to let the DG explain himself, but suggested that they rather make a recommendation to the Parliamentary Committee that “if a person went to an extent that undermines other Members”, they could recommend to Parliament that this person was not fit to hold office and should therefore be removed as a DG. He proposed that they give the Committee time to reflect and then take a position on the matter. Mr Galo agreed with Mr Chauke. They had recently had a joint meeting with the Standing Committee on Public Accounts (Scopa) where the Director General had failed dismally to respond to the questions which were raised. He said the Chairperson had indicated during the opening remarks that the board of Mhlathuze had been disbanded. The presentation could have questions that would have to be responded to by the DG, yet he was not present. He was not sure if the Committee was doing any justice by continuing with this kind of a meeting, as they could not allow that kind of anomaly. The Chairperson then asked the Deputy Minister to give her presentation. Ms Tshwete began by confirming that she had called the Minister, requesting her to ensure that the DG attended the Committee meeting. Initially the Minister had failed to reach him, as he was not picking up his phone, but when she reached him that morning, the Deputy Minister said she discovered that the DG was unaware of the meeting. The Chairperson remarked that the Committee had a problem. Mr Basson commented that whether the DG was there or not was not the issue. They had learned from the previous week’s experience at Scopa. It had been embarrassing to see the DG unable to answer a single question put to him. He proposed that they just go ahead and deal with the matter at hand, as the question of whether the DG was there or not did not make a difference. Mr Chauke commented that the water boards matter on the agenda should not be dealt with, for the sake of compliance. The problem the Committee faced required the attention of the accounting officer. The matters the Committee was dealing with, such as Overberg and Mhlathuze, were not new and had been dealt with during previous meetings. The process of oversight, where people attended a meeting, clapped hands and enjoyed the “muffins,’’ had to come to an end. He said that a number of issues in the DWS were wrong, and gave an example of the previous meeting, where the DG had arrived three hours late. The Chairperson had made concessions for the DG, which had been wrong. He said that “the DG was lying and needed to appear before the Committee”. The Committee was dealing with matters of an entity that could not produce a report, yet it had an allocation of over R40 million. There was currently chaos and no leadership in the DWS. He asked if the meeting should continue, for the sake of compliance, and proposed that the Chairperson raise the issues, as they were very serious. Ms M Khawula (EFF) said that the DG had shown disrespect to the Committee. The Minister had been under the impression that the DG would be present and yet he had defied the Minister’s instructions by not being present. She was glad that the Deputy Minister was present, as she had witnessed the full account of what had transpired. The Committee was taking steps backwards instead of moving forward. She commented that the Committee was there to work and not to play. Mr Makondo agreed that the DG was undermining the work of the Committee. The DG did not understand the issues in the DWS, and the Committee had nearly failed to adopt a budget report due to officials who lacked authority attending meetings which required persons with adequate authority to attend. He reiterated that the meeting could not continue in the DG’s absence. The Chairperson suggested that the issue of the DG be dealt with later after they had dealt with the agenda of the day. Mr Basson agreed with the Chairperson, and said that he believed that ‘one man’ would not make a difference. Mr Chauke said he did not support the decision to go on. The person in charge of making decisions was absent. The Public Finance Management Act (PFMA) recognised the accounting officer as the person authorised to make decisions, but not the Deputy Minister. The Chairperson reminded the committee of the other issues on the agenda, which were the management and governance challenges at the Overberg and Mhlathuze Water Boards, which were supposed to be dealt with. He proposed that the Deputy Minister and the delegations from the water boards be allowed to table their presentations. Ms Baker agreed with the Chairperson’s proposal to proceed and engage with the reports. However, she highlighted that although the Minister was also supposed to be present, they should proceed regardless of those who were absent. Mr Makondo said that there were issues in Mhlathuze that needed to be dealt with. He asked the Chairperson to give a guarantee that if the Committee proceeded with the meeting, the issues would be adequately dealt with, because the accounting officer was absent and yet the issues required his presence. He insisted that having a meeting for the sake of having it was not adequate. The Chairperson asked for the Deputy Minister’s input regarding the fate of the meeting. The Deputy Minister said that she was not in a position to advise the Committee but in turn would be led by it. Ms N Bilankulu (ANC) said that she wanted to check if there was a reason for the Committee to postpone the meeting because the accounting officer was not present. On the previous Wednesday, she had attended the Scopa meeting at which it had been indicated that they needed to get clarity specifically from the accounting officer. Based on that experience, she felt that going ahead with the meeting would be a futile exercise. She was willing to return at a time when the DG was present. Continuing with the meeting meant that justice would not be served. She agreed with the Members who were calling for the meeting not to proceed. The Chairperson said it was clear from the Members that the meeting was not going to proceed due to the absence of the DG. As the accounting officer, he was supposed to deal with the various issues raised, and the meeting had to be rescheduled. Mr Basson suggested that they proceed, as the Deputy DG was present. The Chairperson said that the Committee was hard working. Since 2015/16, the Committee had not received any budget or annual report from Overberg, and Mhlathuze had no board. This was a serious indictment. How could they operate and exist, as Parliament had not approved any budget? He remarked that their existence was illegal. Mr Basson suggested that Members stay behind in order to draft a letter to the DG. The Chairperson agreed.